After reading the Giants dumpster fire article, this fan typed out a sternly worded email entirely in the subject line. Probably. The series drew a lot of angry emails, as it does every year. 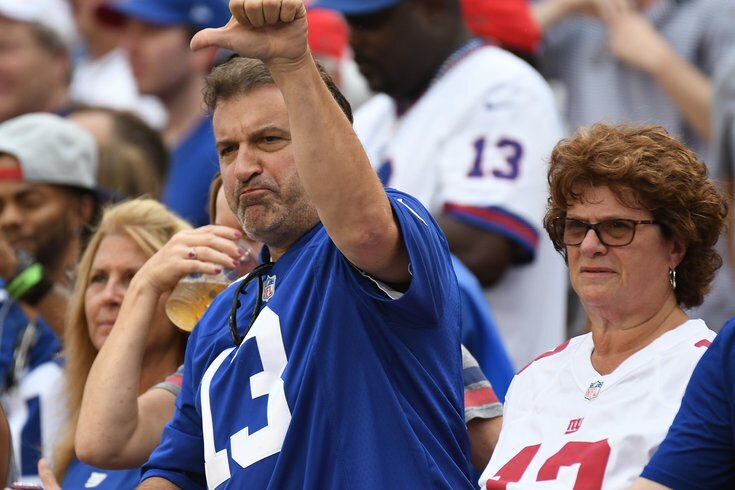 By far and away, the whiniest of the bunch were Vikings fans, followed by Giants fans. I am a Dallas Cowboys fan since the team was started. I can't figure out how you come to a conclusion before they start the season. Some players from the draft, free agency and walk ons have surprised everybody. Players moved to another team may shine. With a change of team, coaching and players they could play better. I think you should hold your predictions at least until the end of preseason. You might be surprised by some players in every team. Look what they were saying about the Eagles. Worst team in their division the season before to Super Bowl Champions the next. All a receiver needs is to be fast and run his routes right. Tight ends need to learn to read the linebackers and find the open space. How do you think Wittenberg because so great. #JimmyRebuttal: I predict the Eagles will win the Super Bowl after the 2017 season, the Patriots after the 2016 season, and the Broncos after the 2015 season. Boom. Nailed it. Also, "Wittenberg?" The Philadelphia Eagles should be proud of their first Super Bowl win in 51 years compared to the Cowboys 5 wins and 8 trips. Let us take an objective review (which I believe a reporter should do) if looking at the Dallas Cowboys and NFC east. The Cowboys will be better at WR.Check Allen Hurns stats vs. Bryant's last 3 seasons and arguably with a lesser QB. Add the fact that we don't have to deal with Bryant's antics and a nice draft choice in Michael Gallup. I guess you should have been a GM since the Cowboys have an overrated line while I think most so called experts might disagree. 3 All Pros plus Lionel Collins second full year at guard and Conner Williams who most think will solve the other guard spot. They also brought in two nice free agents who have started in the past to add depth. Can't argue with the TE position but time will tell. How about we trade you Ezeekial Elliott for Jay Ajay and maybe the Eagles would not "overwork" him so much. Can't argue with some of the play calling and was hoping might replace Linehan. My major concern is depth at linebacker while I think the defensive line is solid and have some of the better younger cornerbacks and might still look to add a safety. Just looking at past few Super Bowl teams from NFC I don't believe they were the pre season favorites. That is why we play the games. #JimmyRebuttal: Lionel Collins, Ezeekial Elliott, Jay Ajay, and Tyrone Smith, lol. Also, I love that he thinks Blake Bortles is better than Dak Prescott. As a writer, you should present evidence as to why a situation exists. In your article, you list a wide range of unproven assumptions ( O Lines that have new members have to be bad) to support a supposition (Giants will stink). I am a writer who has had two million copy sellers. Your article was very amateurish. The Eagles have been a dismal and unexciting team for decades who finally broke through. Now, we are critiquing other teams? #JimmyRebuttal: The OL continuity point was indeed backed up with facts, but whatever. My favorite emails that I get are from people who want to tell me how accomplished they are before they make their point. This approach is rampant among Giants fans. Anyway, I googled this guy to see what his big seller was. Turns out it was a golf tip desk calendar, lol. I guess when you're so used to dealing in desk calendar prose, consuming a lot of words can be hard. #JimmyRebuttal: A common theme of the hate mail received was a notable transition from "You have no rings" to "That was a fluke season." I just finished reading this not knowing who wrote it but my first thoughts were that it's a Philadelphia sports writer. Sure enough. You guys were saying that in 2007 and 2011 and what happened then? #JimmyRebuttal: This guy typed the entirety of his email in the subject line. #JimmyRebuttal: This guy also typed the entirety of his email in the subject line. The last three initials suggest yo AINT a south Philly resident ......you live in Fish Town ! hopefully none of the fans stepped on an innocent by standers head like the fish town goons you live among did a few years back to a bachelor party watching the Phils game. Jim you need a new line of work....perhaps Pats need someone to cut onions each day. Your fan base is pathetic as is your writing style! #JimmyRebuttal: I have no idea whatsoever what this guy is talking about with his references to "Fish Town," a bachelor party, or onions. Hello. My name is --------. I teach Visual Arts at the high school in ---- City, CA. I came across the “10 reasons why the Redskins will be a dumpster fire this season” article. First, it is important to realize that the people in rival NFL organizations are human beings too. They have families they are trying to support and children they are trying to raise. I have seen your staff pictures and you all look like nice people. I understand hometown pride and support of local athletics, but attacking others like this is unnecessary. I suppose that controversy might mean dollar signs and a payday for individuals in the advertising world, but is it really worth what you lose? Maybe there are supporters of the Washington Redskins who publish this type of negativity about other teams, and I would offer them the same message. Let us all try and have a little dignity and promote healthy and fair competition. Heck, you guys won the Superbowl last season and I am happy for the people of Philadelphia. I don’t know, I just think that this kind of sabotage is demeaning to everyone involved and the game of football itself. Something to think about. If you think the Eagles will repeat you are smoking weed.Bet they won’t even be a 500 team.I am happy they won a Super Bowl and that’s coming from a Redskins fan.Just saying. #JimmyRebuttal: He was happy the Eagles won? I won't feel bad for the fans of the Eagles when Barr breaks another leg in Philly. And F the Rocky statue. We'll bring that Bell back to MN. F ing carry on. SKOL. #JimmyRebuttal: This gentleman had to pay Nick Foles $387 in royalties, as he now owns the Skol chant. It's really simple we are charmin soft because it's easy for to wipe away that , that is the s****y eagle fan. Your morals and respect for the game and players are more aligned with president pinocchio. Your city would be a great place to have the first purge. Please make sure beer cans are full before throwing at each other. Thank you from a fan that appreciates the game, players and most fans. #JimmyRebuttal: They're so aligned with "President Pinocchio" that the team had next to zero interest in visiting the White House, and most fans celebrated that decision. Doughboy not all Vikes fans are soft like you. Enjoy your jelly doughnuts and coffee. Congrats on your championship dough! Worst article ever and I will go on the record to say that the Philadelphia Eagles are one of the most classless group of individuals I have ever seen. You win a Super Bowl and do not even have the Professionalism to show up as a unified group to be congratulated by the President whether you like him or not. Your organization won what? ONE SUPER BOWL! and suddenly the whole world thinks it show roll out the red carpet for you guys. Why don't you ask our other neighbors, the Green Bay Packers how many they have? Yeah, getting a little quiet over there huh Philadelphia I rest my case. That's ok we will have a trophy to match and shut up that stupid beer slob looking grin you guys got on your faces right now. Mark my words Aaron Rogers will be in full uniform for the Packers and the NFC North will be stacked with full talent as the Vikings and Packers go at it like never before. The winner of that is going to steam roll all over the Philadelphia. I used to though Philadelphia was once the city where dreams can come true if you put your heart and soul into it as it was once shown by Rocky. But after your guys lack of professionalism and lack to let things go your state doesn't deserve Rocky. Minnesota is Rocky and always has been and when we win we're shipping that trophy all the way down to St. Paul where it will rest nicely in Rice Park right next to the Herb Brooks Statue outside of the Xcel Energy. After this year , Philadelphia can join Tampa Bay as part as the one and done club. So pick your poison Philly? It's etiher going to be Purple Rain or a Cheeseparade. Either way the NFC North is not to be taken lightly and Philadelphia will just be a flash in the pan sports team. So in the meantime why don't you go back to covering civic affairs and leave sports to the real experts . #JimmyRebuttal: This is the strangest email I have ever received from a football fan. If you're an Eagles fan, for example, could you imagine emailing someone saying, "Oh yeah well the Cowboys have more Super Bowl than your team!" Your latest article is a bunch of garbage journalism. You just took some hot takes from ESPN pundits and throw some words around it! #TRASHJOURNALISM In the first paragraph you roast the NFC East, Then say the East is loaded at the bottom of your article! #JimmyRebuttal: I most certainly did not say the NFC East is loaded, especially after trashing it all week.